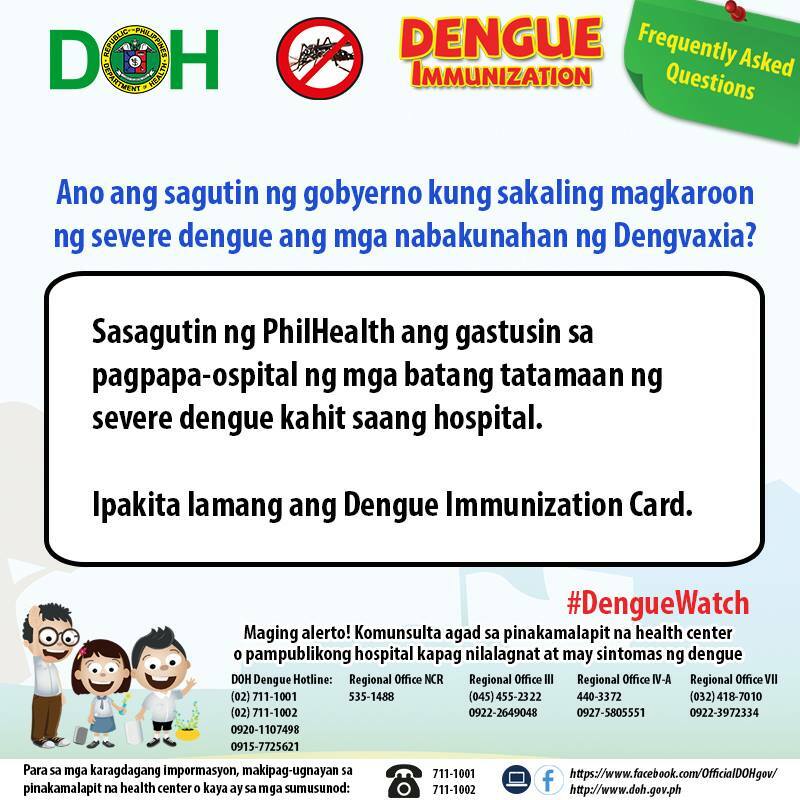 This entry was posted in Health Advisory and tagged #denguewatch, dengue advisory, dengue information on December 26, 2017 by Yami. Health Secretary Francisco Duque III today emphasized that the Department of Health is focused on the more important concerns of parents, teachers and local government units emanating from the administration of the dengue vaccine to more than 830,000 children which began in April 2016. “The DOH continues to refine our response and action plan in the Dengue Task Force to ensure the safety and best health outcomes for children who were vaccinated through heightened monitoring and surveillance, effective management of adverse events following immunization, activation of the dengue fast lanes in public hospitals and truthful and timely risk communication to the public,” Secretary Duque said. 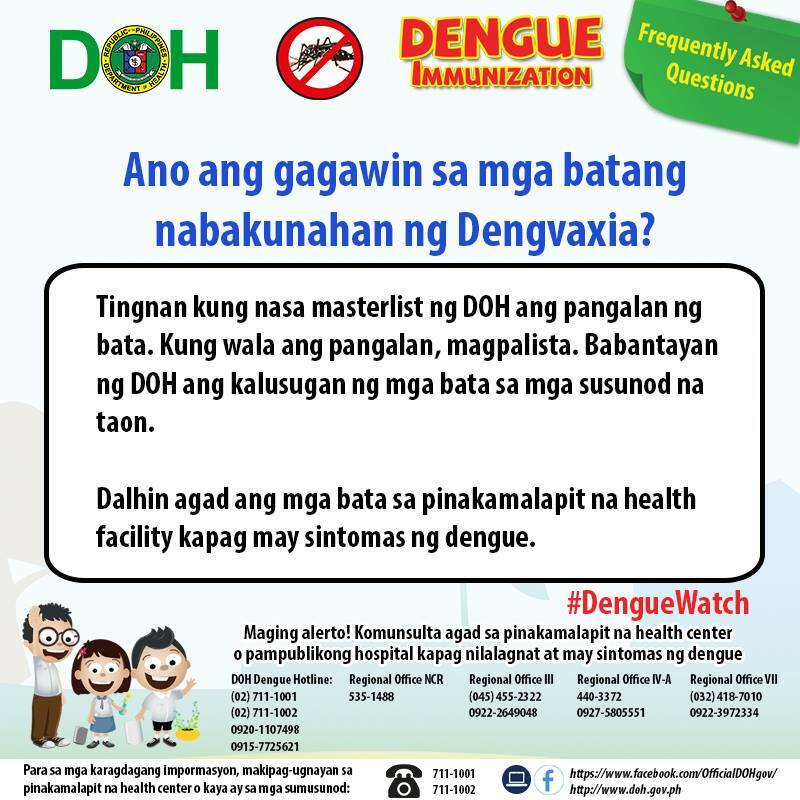 The DOH is set to convene an independent dengue expert panel this week to review the latest evidence on Dengvaxia generated from the 5-year observation period in clinical trials as well as the data available to the DOH through the post-marketing surveillance of the Food and Drug Administration (FDA) and the surveillance of adverse events following immunization (AEFI) at the DOH Epidemiology Bureau. DOH has also partnered with the Philippine General Hospital to conduct an independent review of medical charts of children who may have experienced serious adverse events or died following immunization to determine their probable cause or whether they are related to the vaccination. “Based on the latest update from the WHO, the five-year follow up data provides evidence of reduced risk of severe dengue and hospitalization overall among vaccinated trial participants but also confirmed an earlier hypothesis that those vaccinated with no prior dengue infection could be at higher risk of more severe dengue and hospitalizations. This risk persisted about five years after the first dose,” explained Secretary Duque. The health chief also emphasized the commitment of the DOH to monitor the health of all the vaccinated children in the long run as well as take responsibility for medical care should there be an adverse event that could be related to the dengue vaccine. The DOH also supports the initiatives of the legislature in safeguarding the science-based decision-making and procurement process of the DOH especially for vital health programs such as the Expanded Program on Immunization (EPI). With regard to the various ongoing investigations being conducted by the Department of Justice (DOJ) and both houses of Congress on the propriety of the dengue vaccine purchase, Secretary Duque called for all concerned sectors to allow the investigating bodies to do their jobs without being subject to censure, criticism, and accusations borne largely out of unfounded speculation and suspicion. “We leave it to the appropriate courts to conduct their own independent investigation and to determine whether all the legal requirements were satisfactorily met in the purchase of the Dengvaxia vaccine. 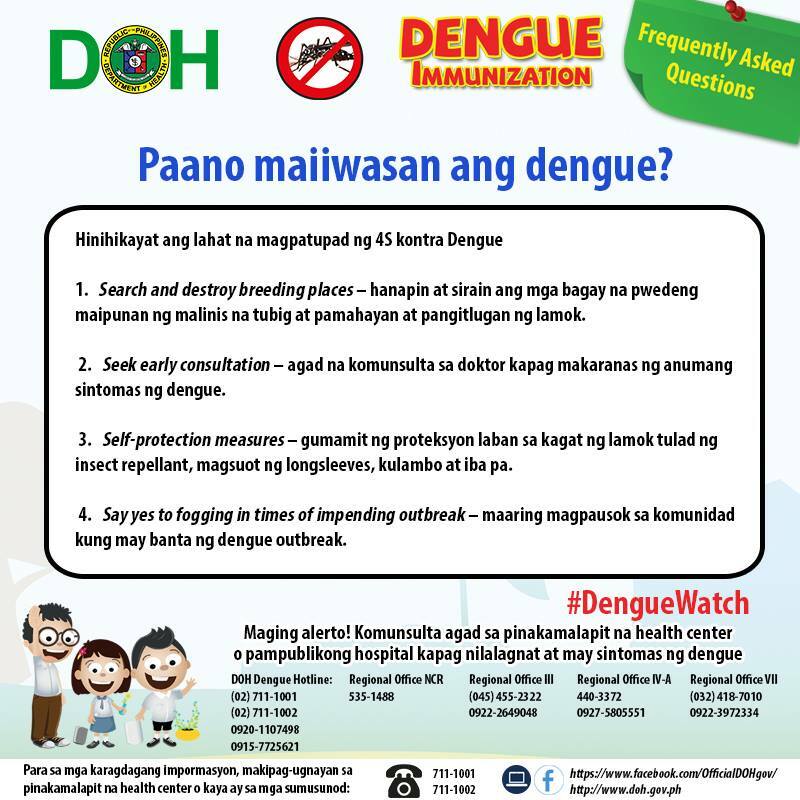 For now, the DOH is heavily immersed in efforts to attend to public concerns on the dengue vaccine and determine the proper course of action to take in managing the over-all situation. We shall also put in place the necessary measures to ensure the observance of proper procedures in the introduction of new vaccines into our public health programs,” said Secretary Duque. From the moment concern was raised on Dengvaxia due to the public disclosure made by Sanofi on November 29, the Department of Health has been transparent to all sanctioned investigatory bodies who were given full access to pertinent data. Secretary Duque wishes that all agencies and individuals associated with these issues would extend the same cooperation. The DOH is slated to submit all documents requested by the National Bureau ofInvestigation (NBI) when executive offices reopen on December 27. The DOH Secretary stressed, however, that the most important matter to address at this time is ensuring the health and well-being of the children who received doses of Dengvaxia as part of the pilot effort. 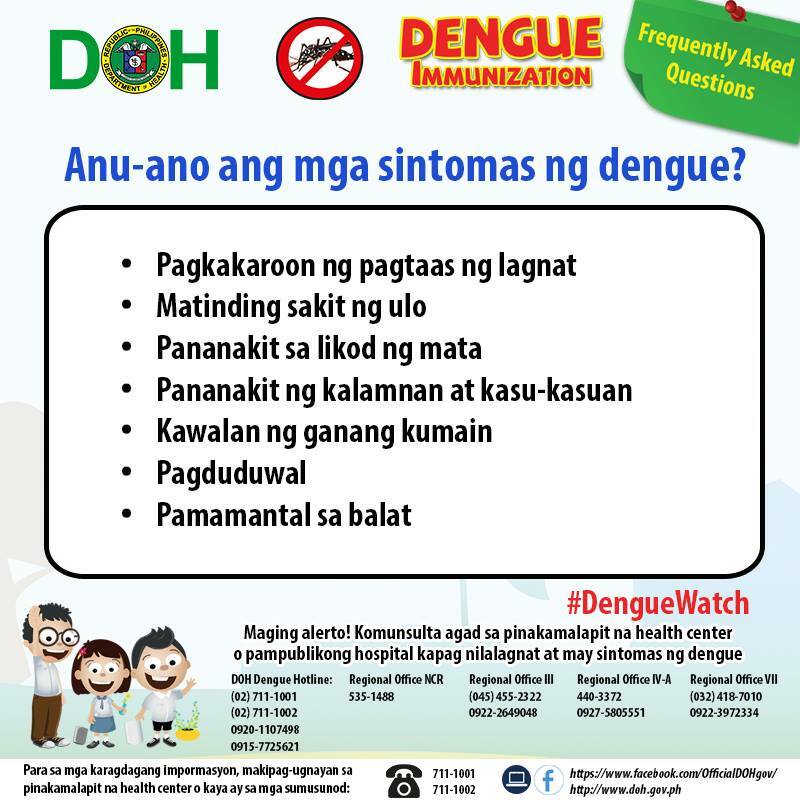 Presently, all systems are in place at DOH healthcare facilities in the regions covered by the dengue vaccination to monitor report and manage any suspected adverse event. Risk communication initiatives have also kicked off in affected communities to inform parents and caregivers of vaccinated children on what signs and symptoms to look out for and where to seek consult. “I am absolutely certain that we can all appreciate a better outcome if we all agreed to move forward and cooperated with each other in the task of ensuring the health of the populace,” Secretary Duque added. This entry was posted in Health Advisory, Press Release and tagged dengue, dengue vaccine, health problem, pressing issues about dengue vaccine on December 26, 2017 by Yami.